For what's gotta hurt - see this. I might need to explain - if the link no longer shows it. 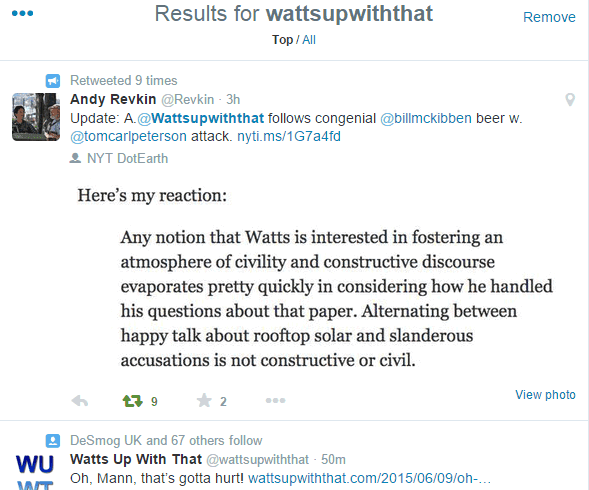 I caught a coincidental juxtaposition, a tweet from Andy Revkin sitting right above a tweet from Anthony Watts - in the WUWT twitter timeline. Andy Revkin's update has got to hurt Anthony. Andy's tweet was sitting right on top of a tweet from Anthony Watts. Anthony was gloating that the book "Climate Change the Facts" is rated higher at Amazon than the new (2nd) edition of the book Dire Predictions by Michael Mann and Lee R. Kump. The second edition of Dire Predictions (print version) is moving up the ranks quite quickly, incidentally. It's already at #34 in Books > Environmental Studies and #56 in Books > Climatology. I'm told the Kindle version will be out in July. Hos many years did it take Revkin to get this? He gets it all the time, but then forgets again. No matter how long I look at this exchange, and despite also reading the linked article by Revkin at dotearth, I still don't understand Watts' response, and what it has to do with Michael E. Mann (though, for deniers it's always all about Mann, isn't it?). 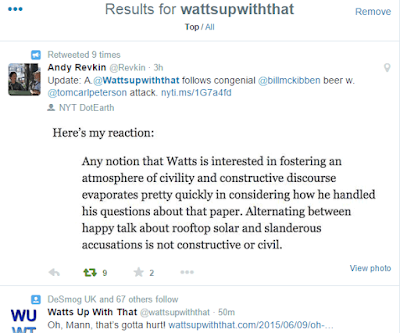 Watts has just been seen for what he really is by Revkin, and yet he says: "..that's gotta hurt!" According to me, it should be Watts getting hurt here, not Revkin. Am I missing something, or is Watts just too dumb to realise he's been had? I added an explanation to the article, MM. It's not a response from Anthony. In the WUWT twitter timeline, Anthony's tweet was coincidentally sitting just below the tweet from Andy Revkin and I took a screenshot. Watt's Twitter was about a book by the usual denialists. I see Watts is crowing that the latest anthology of denial is riding higher in the Amazon rankings than Michael Mann's 'new' book. Watts couldn't do an unskewed comparison if his life depended on it. I left a short note, 50-50 chance it will get posted. Michael Mann's 'new' book is in fact a reprint. The original came out in 2008, and is still in the Climatology Top 100. A better comparison might be with his more recent 'Climate Wars', which sold rather well. What's really gotta be hurting some poor sucker. Anthony Watts noticed that stocks of the denier book had run out at Amazon (temporarily) and took the opportunity to auction off one that he had, which he promised to sign for any of his adoring fans who wanted it. Here's the result of the auction $520! Greens leader Richard Di Natale found a use for it. "Climate: Change the Facts" -The holed truth and nothing but the holed truth. Now on sale at a special price of 18 cents! Purchase your copy now before the price goes back up to 2 cents! Andy Revkin finally gets a clue. I have been a subscriber to the NYT for about 4 years. Two years ago the NYT ditched its Green Blog during a large staff retrenchment. If you'd never encountered the NYT Green Blog let me say that it could have easily been mistaken for the Guardian. It was that good. Andy Revkin is what's left. Even that utter joke of a rag The Washington Post has better climate coverage than the NYT and the Sydney Morning Herald certainly does. I took out the NYT subscription for two reasons. The Green Blog and Paul Krugman. That I still maintain my subscription is all down to Krugman. Actually, I think that Justin Gillis' coverage of climate issues is excellent. Revkin, not so much. I think Cris Mooney is doing fine in Washington Post..
Ah, irony - natures way of puncturing our over-inflated egos. Of course, you have to be listening to the irony, and I doubt Watts is. I see Schollenberger has had the "attack dogs" set on him. Courtney et al. Most amusing - though he is correct in this instance. I've put up something in his defence (Toneb), and with a swipe at the hypocricy displayed (including a dig at stealey). I'm particularly fond of when the wuwter nutters try and ape the style of their beloved Monckton. Richard S Courtney is a grown man and look at how he carries on! Sue: on the "Oh, Mann, that's gotta hurt!" thread on WUWT. Which goes back to the central problem of this book. There is good work in this book. I just can’t endorse it because it is associated with terrible, unscientific claims which have no basis in reality. This book claims to be providing “The Facts” of climate change, but the first third of the book is pretty much completely wrong. It is left to HW readers' imaginations as to what sort of a response that might provoke on WUWT. Yes, it's amusing as Schollenberger has historically been on "their" side. Courtney is essentially saying that "does not Drive" is not saying "does not change". But of course "drive" has a specific meaning ... and it is driving AGW. Of course they're away with the Fairies and playing with them down the rabbit-hole with Alice. So it's all a waste of time - but, as I said, amusing to see them when someone pokes a stick down the hole. If ever there was a complete display of utter nuttery it's there in that thread. A lot of them seem to think that if they can buy up all the copies of that woeful book it will force CO2 to stop having greenhouse properties. Heck, it'll probably precipitate an ice age.. The appetite deniers have for conspiracy nuttery stretches credibility to the limit. How many of them are for real do you think? How many of them have noticed that each chapter in their book contradicts every other chapter? Could it be that under the eve of the denial circus in DC somebodies have bought a very big box of that book to make that headline.. And to have "educational" stuff to send around via post later on..? Could that work..? It is done all the time by the right wing in the US. The NYT has long noted when the sales of books on it's best seller list are aided by "bulk sales". It always seems to be books by wingers, I wonder why? I was kind of surprised how much they entertained themselves over "there" with toxic comments about Rachel Carson and benevolence of ddt.. Not been there that much though.. Sou is making excellent work in informing about what they are up to - but shielding from the worst.. Umm.. "views"